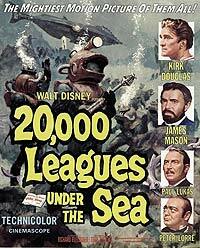 20,000 Leagues Under the Sea (1954) - Sci-fi-central.com.  USA  1954  127m   Directed by: Richard Fleischer.  Starring: Kirk Douglas, James Mason, Paul Lukas, Peter Lorre, Robert J. Wilke, Ted de Corsia, Carleton Young, J.M. Kerrigan, Percy Helton, Ted Cooper, Walter Bacon, John Barton, Oscar Blank.  Music by: Paul J. Smith. The oceans during the late 1860-92s are no longer safe; many ships have been lost. Sailors have returned to port with stories of a vicious narwhal (a giant whale with a long horn) which sinks their ships. A naturalist, Professor Aronnax, his assistant, Conseil, and a professional whaler, Ned Land, join an US expedition which attempts to unravel the mystery. Jules Verne's classic novel is brought to the big screen here in probably the most well-known and best adaption of the novel. The film notably comes from Disney, which is surprising when you think about it because of how dialogue driven and character driven the film really is. It is impressive how well the film still holds up to this day and that it manages to remain constantly interesting despite little action. The film is still somewhat under-appreciated, whether that is because of Disney's title is unsure because the film still grips and entertains with ease. The story sees the oceans assumed unsafe during the late 1800s as a number of ships have been destroyed by what people are calling a monster. A naturalist professor, his assistant and a whaler join an expedition to unravel the mystery. But when they're vessel is destroyed and they are the only three who survive, the come aboard the 'monster' and realise it is a high-tech submarine run by the highly intelligent Captain Nemo. Nemo is distant to them at first, but slowly allows them to into his ideology. The story is very interesting, the mystery of Nemo's views on life are presented and left for the audience to make judgement on. I really like how the film portrays the four ideologies of these men and lets their views on warfare bounce around, as this is what forms the plots backbone. The film is very story driven so that fact that the plot is this good really helps make the film standout. The four lead actors are what really make the film memorable. All four create engaging people and get their personality traits down perfectly. James Mason is simply superb as the complex and tragic Nemo. He displays Nemo as a man that was far ahead of his time and wounded by how harmful man's actions can be. The fact that he has retired to the sea shows how much he wants to get away from the actions of his fellow humans. Paul Lukas is equally as brilliant in his very calming and touching portrayal of Professor Aronnax. He is one of a few who believes that he can convince Nemo to change his views on humanity and see that there is some good left. Both Mason and Lukas give wonderfully intelligent performances. Kirk Douglas puts his gruff persona and chiselled looks to good use as the vigorous everyday sailor Ned Land. Land's more bombastic attitude and hands on approach brilliantly corresponds those of Nemo and the professor. Peter Lorre is also excellent support as the professor's easily panicked assistant Conseil. Lorre's agitated expressions and nervous delivery are just perfect for the character, as Lorre makes what could have been a forgotten role extremely notable. It is striking at just how well the film holds up and how the visual aspects have hardly dated thanks to expert techniques used. The claustrophobic nature of the Nautilus is the perfect metaphor for how trapped the three men feel at first, whilst the submarine itself is a stunning creation thanks to its Gothic design and colourful scenery. The scenes filmed out at sea and under the oceans waves look very authentic, even the use of blue screen is difficult to notice at times. When the action set pieces do turn up they are very well shot and full of tension. The famous giant squid attack looks very good, thanks to shooting the scene in a storm, and has a lot of excitement. The scene were Ned enters the natives land is also very good thanks to the excellently crafted suspense, you can even forgive the dodgy electricity effects. The dialogue and interactions are another highlight. This is an extremely character driven film after all, the main thing that the film does is to try and have the views of the four leads bounce of each other in order to place them in an interesting dilemma. The three men have difficulty accepting Nemo's views and have trouble working out reasons for his motives. While Ned and Conseil dismiss him as a madman, the professor notes that Nemo does have his reasons as him becomes a confident for the captain. Nemo turns into more of a tragic character as we learn his true motives and this creates a great anti-hero for the audience to decide to agree with or turn away. The more that the professor gets sucked into Nemo's ideology creates the perfect conflict as Ned and Conseil cannot decide what action to take. As said the dialogue is brilliant. I really like how smart it is and how the conversations of the men are always interesting. It also allows us to see through the characters eyes and find out what they are feeling, like with the professor's journal. There are some funny quips such as Lorre claiming that messages in bottles when out with Robinson Crusoe that are well placed throughout. The score from Paul Smith fits in soundly as well. It does sound rather grand and manages to convey the elements of suspense very well. Even Kirk Douglas tune 'Whale of a Tale' is a very enjoyable number. 20,000 Leagues might very well be one of the best adventure movies ever made, it is certainly one of Disney's best live action pieces. For such a reserved and dialogue driven film it is amazing how interesting and entertaining it manages to be. That in part is down to the four lead actors who, as said, are all absolutely fantastic jobs. It is also in part to an excellent script and some truly outstanding production design that also help to make the film a masterpiece. 20,000 Leagues is always entertaining, filled with interesting ideas, superb acting and wonderful visuals it is impossible not to find something to enjoy. Review by chrishart94 from the Internet Movie Database.